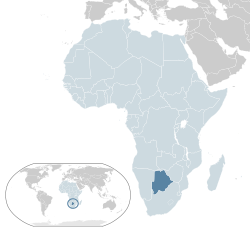 Botswana (offeecially the Republic o Botswana (Tswana: Lefatshe la Botswana), is a laundlocked kintra locatit in Soothren Africae. Umwhile the Breetish pertectorate o Bechuanaland, Botswana adoptit its new name efter acomin independent within the Commonweel on 30 September 1966. Syne then, it haes mainteened a strang tradeetion o stable representative democracy, wi a consistent record o uninterruptit democratic elections an the best perceived corruption rankin in Africae syne at least 1998. Botswana is topografically flat, wi up tae 70 percent o its territory bein the Kalahari Desert. It is mairchit bi Sooth Africae tae the sooth an sootheast, Namibie tae the wast an north, an Zimbabwe tae the northeast. Its mairch wi Zambie tae the north near Kazungula is puirly defined but is, at maist, a few hunder metres lang. A mid-sized kintra o juist ower 2 million fowk, Botswana is ane o the maist sparsely populatit kintras in the warld. Aroond 10 percent o the population lives in the caipital an lairgest ceety, Gaborone. Umwhile ane o the puirest kintras in the warld—wi a GDP per capita o aboot US$70 per year in the late 1960s—Botswana haes syne transformed itsel intae ane o the warld's festest-growin economies. The economy is dominated by minin, kye, an tourism. Botswana blowsts a GDP (purchasin pouer parity) per capita o aboot $18,825 per year as o 2015[update], that is ane o the heichest in Africae. Its heich gross naitional income (bi some estimates the fowert-lairgest in Africae) gies the kintra a relatively heich staundart o leevin an the heichest Human Development Index o continental Sub-Saharan Africae. Botswana is a member o the African Union, the Soothren African Development Commonty, the Commonweel o Naitions, an the Unitit Naitions. The kintra haes been amang the haurdest hit bi the HIV/AIDS epidemic. Despite the success in programmes tae mak treatments available tae thae infectit, an tae eddicate the populace in general aboot hou tae stap the spread o HIV/AIDS, the nummer o fowk wi AIDS rose frae 290,000 in 2005 tae 320,000 in 2013.:A20 As o 2014, Botswana haes the third-heichest prevalence rate for HIV/AIDS, wi reuchly 20% o the adult population bein infectit. ↑ 1.0 1.1 "Botswana". The World Factbook. Central Intelligence Agency. 2014. Retrieved 16 April 2014. ↑ "2015 Human Development Report Summary" (PDF). United Nations Development Programme. 2015. p. 17. Retrieved 14 December 2015. ↑ Gross naitional income (GNI) – Nations Online Project. Nationsonline.org. Retrieved on 27 October 2016. ↑ "The Gap Report" (PDF). Geneva: UN AIDS. 2014. Archived frae the oreeginal (PDF) on 20 June 2016. Retrieved 21 June 2016. ↑ "HIV and Aids in Botswana". Avert International Aids Charity. Retrieved 21 June 2016. Wikimedia Commons haes media relatit tae Botswana. This page wis last eeditit on 20 August 2018, at 22:00.